Gaia needs us all – every one. I started in to do a mandala because for weeks I’d been getting the 5 of Wands in the Inner Child Tarot where a fairy is unfolding the last petal of a flower. The book about it says, among other things, to go paint a mandala. I failed as usual to get it centered and expanding in proper proportion. So I gave up trying and just painted. 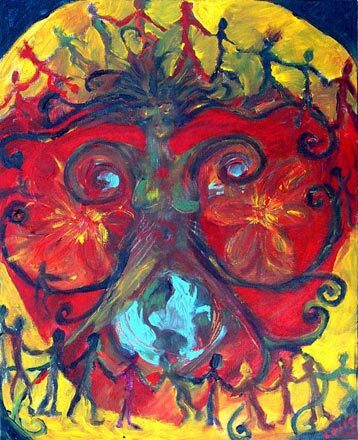 I could see the face in there like the old boogie man or genie who haunted me in my earliest paintings, but I concentrated on the Gaia figure in the middle. And on the circle of people on the outside. I thought often as I painted of the Oregon Reservist I recently sat next to on the plane on his way to fight in Iraq. We wept together at the turn his life had taken. As I painted, I kept getting the message that we need all manner of people. And that the journey of each one is a vital and important one. Not to be judged or feared or even pitied. But held dearly close to our hearts. I forgot about the mask but when I finished there it was still – Villachocha the sky father in Peru or perhaps, the Green Man. Father Earth. May they join in each of us.